Here is your chance to be one of 3 Chromebook winners, just by getting connected on the NE Hub. The website has a new look and easier navigation. Best of all, it includes a forum – the NE Hub – where members can ask each other questions, share notable news items and post inspirational pieces. Watch this helpful tutorial video for getting started with the New Website. How Do I Win a Chromebook? Subscribe to (at minimum one) Forum of interest. Post a Minimum of 3 times (either start a new post and/or post replies to existing posts) by Dec 15th. Increase your chances: For every 3 posts/replies after the initial qualifications are met, you will be given an extra entry into the drawing. Once qualifiers have been met, you will be added into a drawing for the Grand Prize ChromeBook. Extra entries will be added as additional posts are made. Winners will be notified via their NEdpg.org Profile accounts and announced in NE channels of communications: Social Media, member e-blast, the NExchange Forum, website. Member qualifying posts or replies can be made in any Group/Forum including the NE Hub Group Forums as well as all the Specialty Group Forums. Current NE Executive Committee (EC) Members are not eligible for this contest. Any unclaimed prizes will be donated to a dietetic program determined by NE EC. Want the Conversations in your Inbox? Click Subscribe at the top of any Forum you want to be notified of new TOPICS. To receive email notifications of all Replies within a Topic, "Subscribe" to it and you will get all the conversation right in your inbox. First Time Login? Go HERE and use your Academy Email Address to set up a password. Your Username will be your Academy Email Address. You can change your Email Address and your Password in your Profile Settings. When logging into the website, use your Email Address as your Username and the new password you created. 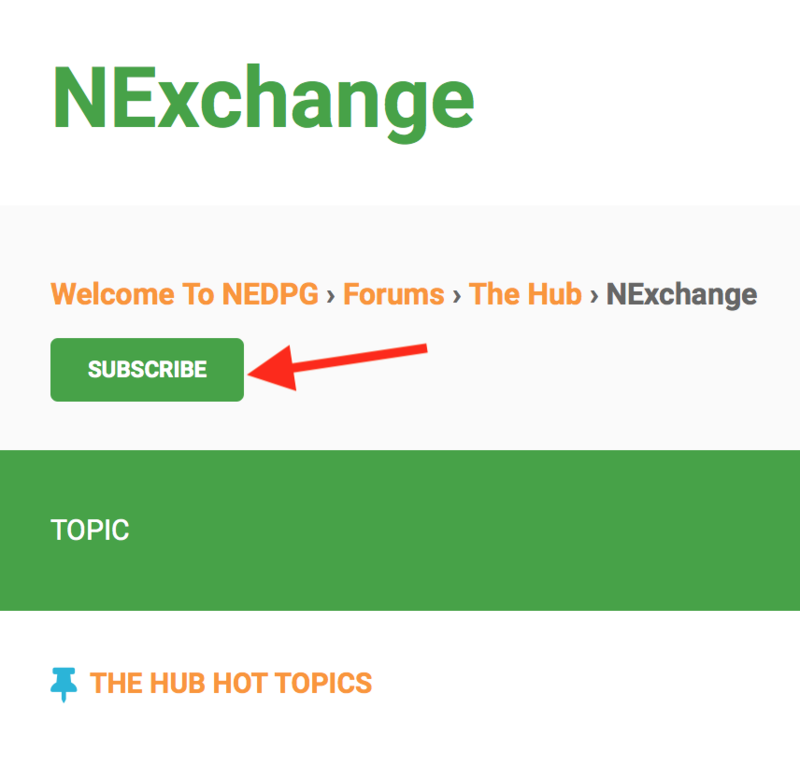 Email NEadmin@NEdpg.org with any questions. Copyright © 2018 Nutrition Entrepreneurs Dietetic Practice Group, All rights reserved.